The glucose concentration of the airway surface liquid (ASL) is much lower than that in blood and is tightly regulated by the airway epithelium. ASL glucose is elevated in patients with viral colds, cystic fibrosis, chronic obstructive pulmonary disease, and asthma. Elevated ASL glucose is also associated with increased incidence of respiratory infection. However, the mechanism by which ASL glucose increases under inflammatory conditions is unknown. The aim of this study was to investigate the effect of proinflammatory mediators (PIMs) on the mechanisms governing airway glucose homeostasis in polarized monolayers of human airway (H441) and primary human bronchial epithelial (HBE) cells. Monolayers were treated with TNF-α, IFN-γ, and LPS during 72 h. PIM treatment led to increase in ASL glucose concentration and significantly reduced H441 and HBE transepithelial resistance. This decline in transepithelial resistance was associated with an increase in paracellular permeability of glucose. Similar enhanced rates of paracellular glucose flux were also observed across excised trachea from LPS-treated mice. Interestingly, PIMs enhanced glucose uptake across the apical, but not the basolateral, membrane of H441 and HBE monolayers. This increase was predominantly via phloretin-sensitive glucose transporter (GLUT)-mediated uptake, which coincided with an increase in GLUT-2 and GLUT-10 abundance. In conclusion, exposure of airway epithelial monolayers to PIMs results in increased paracellular glucose flux, as well as apical GLUT-mediated glucose uptake. However, uptake was insufficient to limit glucose accumulation in ASL. To our knowledge, these data provide for the first time a mechanism to support clinical findings that ASL glucose concentration is increased in patients with airway inflammation. The airway epithelium is covered by a thin layer of surface liquid (ASL), which is vital for mucociliary clearance and necessary for maintaining the sterility of the respiratory tract. The volume and composition of ASL is tightly regulated. Our group has previously shown that glucose is present in ASL, but at much lower concentrations than in blood (ASL glucose, ∼0.4 mM; ∼12.5-fold lower than blood) (1, 2). The importance of ion transport across the airway epithelium and its role in maintaining salt and fluid homeostasis of ASL has long been established, but until relatively recently, little was known about the role of glucose in ASL. ASL glucose concentration is the net effect of paracellular diffusion from blood/interstitial fluid across respiratory epithelium into ASL and removal of glucose from ASL by uptake into epithelial cells through glucose transporters and subsequent cellular metabolism. Transcellular glucose movement has also been reported but this was significantly exceeded by both apical and basolateral uptake (3, 4) (see Fig. 8). Glucose uptake across human airway epithelial cell membranes is mediated by facilitative glucose transporters (GLUTs; SLC2A gene family). We have previously detected GLUT-2 protein in both apical and basolateral membranes of H441 airway epithelial cells and in epithelial cells from human bronchial biopsies (5). In primary human bronchial epithelial (HBE) cell cultures GLUT-10 is expressed on the apical membrane and GLUT-1 on the basolateral membrane (6). Sodium-coupled glucose transporter (SGLT) protein has not been found in human airway epithelial cells in vitro. In H441 cell monolayers, phloretin (an inhibitor of GLUT-mediated transport) inhibited d-glucose uptake across the apical and basolateral membranes and increased the appearance of d-glucose in the apical compartment (3). Similarly, in HBE cell monolayers, 2-deoxyglucose (a substrate for GLUTs but not for SGLT) was taken up across the apical and basolateral membranes (6). Overall, these findings indicate that glucose uptake through apically localized GLUTs plays an important role in maintaining low ASL glucose concentrations. In humans, ASL glucose concentrations are elevated when the airway epithelium is inflamed or when blood glucose is elevated. Nasal glucose concentrations are undetectable (<1 mM) in healthy volunteers, but detectable in 50% of patients with symptoms of viral rhinitis (∼1 mM) and 90% with diabetes mellitus (∼4 mM) (1). Breath glucose is elevated in people with lung inflammation due to cystic fibrosis (2.0 ± 1.1 mM), with hyperglycemia due to diabetes mellitus (1.2 ± 0.7 mM), and to highest concentrations in people with both cystic fibrosis and diabetes mellitus (4.0 ± 2.0 mM) (2). Intensive care patients with elevated ASL glucose concentrations are more likely to have respiratory infection, particularly with methicillin-resistant Staphylococcus aureus, than those with normal ASL glucose (7). Patients with chronic obstructive pulmonary disease (COPD) who also have diabetes mellitus are more likely to have Gram-negative organisms cultured from sputum than those without diabetes (8). Therefore, maintenance of low ASL glucose is essential for preservation of airway sterility. Although we now have a basic understanding of the mechanisms that control glucose homeostasis in the airways, the effect of inflammatory conditions on these regulatory mechanisms is unknown. Therefore, the aim of this study was to investigate the effects of proinflammatory mediators on glucose uptake (through GLUTs), paracellular glucose flux, and the resultant net changes in ASL glucose in human airway epithelia. This study provides new insights into mechanisms that lead to elevated ASL glucose concentrations and compromise airway sterility in patients with inflamed airways. Immortalized human airway epithelial cells (H441) obtained from the American Type Culture Collection (Manassas, VA) were cultured in RPMI 1640 media containing 10% FCS (Invitrogen, Paisley, U.K.), 10 mM glucose, 2 mM L-glutamine, 1 mM sodium pyruvate, 5 μg/ml insulin, 5 μg/ml transferrin, 7 ng/ml sodium selenite, 100 U/ml penicillin, and 100 μg/ml streptomycin. Polarized monolayers were produced by culturing cells for 7–10 d on permeable membrane supports (Transwells; Corning) at the air–liquid interface (ALI). The basolateral membrane was exposed to RPMI 1640 media containing 4% charcoal-stripped serum, 10 mM glucose, 200 μM dexamethasone, and 10 nM 3,3′,5-triiodothyronine, 2 mM l-glutamine, 1 mM sodium pyruvate, 10 μg/ml insulin, 5 μg/ml transferrin, 7 ng/ml sodium selenite, and 100 U/ml penicillin. HBE cells (Clonetics) were cultured in bronchial epithelial cell basal media containing bronchial epithelial growth medium SingleQuots (Clonetics) in a T-162 flask (Fisher) until confluent. HBE cells were seeded at 8.25 × 104 cells/well on Transwells and fed with differentiation media containing 50% bronchial epithelial cell basal media/50% DMEM (4.5 g/ml glucose), bronchial epithelial growth medium SingleQuots (without triiodothyronine, retinoic acid, and GA1000), gentamicin (50 μg/ml), and all-trans retinoic acid (5 × 10−8 M; all Clonetics). HBE cells remained submerged in differentiation media for 7 d, after which they were taken to the ALI for 7–14 d to form fully differentiated confluent monolayers. LPS has been shown to elicit inflammatory cytokine secretion in human and mouse airways in vivo (9, 10). We therefore used LPS for treating the mouse airways. However, treatment with LPS (15 μg/ml) in previous experiments using H441 cells did not significantly affect transepithelial resistance (11). A wide range of pro inflammatory cytokines have been shown to be upregulated acutely and chronically in lung disease. In diseases such as cystic fibrosis and COPD, levels of TNF-α and IL-1β have been shown to be raised (12–14). Additionally, increased levels of IFN-γ were observed in COPD, and IFN-γ mRNA was detected in the airway epithelium of CF patients (15, 16). In a study using human alveolar epithelial cells, Coyne et al. (17) showed that treatment with TNF-α (10 ng/ml) and IFN-γ (100 ng/ml) together (but not alone) significantly reduced transepithelial resistance over a similar time course used in this study. However, the addition of IL-1β (100 ng/ml) did not have any further affect. Therefore we used a mixture of proinflammatory mediators (PIMs), consisting of TNF-α (100 ng/ml), INF-γ (100 ng/ml) (concentrations similar to those detected in CF patients; see Ref. 17), and LPS (from Pseudomonas aeruginosa and Escherichia coli; 10 μg/ml) applied to both the apical and basolateral surfaces of polarized airway epithelial monolayers in glucose-containing RPMI 1640 media (volumes were 50 μl and 1 ml, respectively). Control untreated monolayers also had RPMI 1640 media (50 μl) applied to the apical surface. Cells were treated for 24, 48, and 72 h with PIMs, with treatment ending on the same day after seeding (see Fig. 1A). External glucose concentrations are known to modify GLUT expression in other epithelia, such as the intestine (18) and pancreatic islets (19). To control for potential changes in ASL glucose concentration produced by PIM treatment, airway cell cultures were bathed with media containing 10 mM glucose on both surfaces during PIM treatment. Thus, any changes determined on GLUT-mediated glucose transport were a product of PIM treatment and not glucose concentration. Cell viability in monolayers treated with and without proinflammatory mediators was tested by trypsinizing the monolayer and analyzing the live/dead cell count (identified by trypan blue exclusion) using a hemocytometer. Cells grown at ALI were washed twice with glucose-free transport medium (15 mM HEPES buffer [pH 7.6], 135 mM NaCl, 5 mM KCl, 1.8 mM CaCl2, and 0.8 mM MgCl2) to remove culture medium, then incubated for 15 min at room temperature in the same solution to deplete the cells of intracellular glucose. To study the effects of PIM treatment on airway epithelial glucose transport, uptake experiments were performed with radiolabeled glucose ([14C]d-glucose) on both H441 and primary HBE monolayers, as described previously (5). Experiments were initiated by replacing the medium with 0.5 ml transport medium containing 1.0 μCi [14C]d-glucose plus 10 mM nonradiolabeled equivalent glucose to either the basolateral or apical side of the monolayer, followed by incubation at room temperature for 10 min. Preliminary experiments indicated that uptake was linear between 0 and 10 min (data not shown). Uptake was terminated by adding 2 ml ice-cold stop solution (15 mM HEPES buffer [pH 7.6], 135 mM choline Cl, 5 mM KCl, 0.8 mM MgSO4, 1.8 mM CaCl2, and 0.2 mM HgCl2). The cells were then rinsed twice with 2 ml stop solution and lysed in 0.5 ml 10 mM Tris-HCl (pH 8.0) with 0.2% SDS. Lysed samples were added to 2 ml scintillation mixture and radioactive emissions were determined using a scintillation counter to quantify glucose uptake. GLUT-mediated glucose uptake was studied using phloretin (1 mM dissolved in ethanol; an inhibitor of GLUT-mediated glucose uptake) (18). Phloretin or its vehicle (ethanol) was added to apical or basolateral chambers in the preincubation period (20 min) prior to addition of d- and l-glucose. Uptake was calculated as nmol glucose/mg protein and converted to percentage control to compensate for variability between batches of cells. To measure transepithelial glucose flux and transepithelial electrical resistance (RT), H441 cells grown at ALI were mounted in Ussing chambers maintained at 37°C. Both sides of the epithelial cells were bathed in a physiological salt solution: 117 mM NaCl, 25 mM NaHCO3, 4.7 mM KCl, 1.2 mM MgSO4, 1.2 mM KH2PO4, 2.5 mM CaCl2 (equilibrated with 5% CO2 to pH 7.3–7.4). The solution was bubbled with 21% O2 plus 5% CO2 premixed gas and continuously circulated throughout the course of the experiment. Prior to the experiment, cells were washed and then incubated for 15 min in glucose-free medium. Cells were then mounted in Ussing chambers as above. Flux experiments were initiated by adding 10 mM d-glucose to salt solution containing 1.0 μCi [14C]l-glucose to the basolateral side of the epithelial cells. l-glucose is the metabolically inert, nontransportable stereoisomer of d-glucose and thus can only cross the membrane by passive diffusion via paracellular pathways. After mixing, initial samples of 200 μl were removed immediately from the apical and basolateral baths. Apical and basolateral samples (200 μl) were taken every 10 min up to 60 min and the concentration of radiolabeled glucose was analyzed using a scintillation counter. Transepithelial movement of [14C]l-glucose from the basolateral to the apical chamber was determined by measuring the amount of tracer radioisotope/glucose as cpm that had appeared in the apical tracer/glucose-free chamber. Glucose equivalence was calculated using the equation: (Δcpm in the apical chamber/total cpm in the basolateral chamber) × Δ time × concentration of glucose (20). To evaluate the effects of PIMs on the glucose concentration of the surface liquid overlying H441 monolayers, the apical surface was washed and monolayers were placed in 50 μl glucose-free media and left for 24 h to equilibrate (glucose removed 24 h prior to conclusion of PIM treatment time course; see Fig. 1A). Apical fluid was removed from the cell surface and pooled in triplicate for each condition. No difference in apical fluid volume was observed between monolayers. ASL glucose was measured using a glucose oxidase analyzer (Analox Instruments, London, U.K.). The permeability of the cell monolayer to ions was routinely assessed by measuring RT using an epithelial voltohmmeter (EVOM; World Precision Instruments, Stevenage, U.K.) attached to “chopstick” electrodes. RT was also monitored during flux experiments by briefly clamping transepithelial potential difference to 0 and 2.0 mV at regular intervals and measuring the short circuit current. RT (Ω⋅cm2) was calculated as change in voltage (mV)/change in current (mA). Membrane protein fractions (50 μg) were separated on 4–12% Bis-Tris acrylamide gels, transferred to polyvinylidine difluoride membranes, and incubated overnight at 4°C with anti GLUT-2–GLUT-10 affinity-purified antisera (1:200; Alpha Diagnostics, San Antonio, TX) or mouse monoclonal anti–β-actin (1:500; Abcam, Cambridge, U.K). Blots were washed three times in PBS plus 0.01% Tween 20 and then incubated with rabbit anti-mouse secondary antiserum (1:200) (GE Healthcare, Little Chalfont, U.K.) followed by streptavidin-HRP conjugate (1:200) (GE Healthcare) for 1 h each at room temperature. Immunostained proteins were visualized using ECL Western blot analysis system (NEN Life Science Products, Boston, MA; Western Lightning from PerkinElmer, Norwalk, CT) and exposure to x-ray film. All Western blots were repeated three times. Binding specificity of GLUT-2 and GLUT-10 Abs was confirmed in a repeat experiment where membranes were preincubated with antigenic peptides. H441 cells grown on Transwells were fixed with paraformaldehyde for 10 min. Cells were blocked with 10% bovine serum in 0.1% Triton X-100/PBS. Cells were incubated with rabbit polyclonal Abs raised against human GLUT-2 and GLUT-10 transporters (1:500 dilution in 0.1% Triton X-100/PBS; Alpha Diagnostic) at room temperature for 1 h. After washing three times for 10 min in PBS, sections were incubated in FITC-conjugated goat anti-rabbit IgG (1:1000) diluted in 0.1% Triton X-100/PBS for 1 h at room temperature. Slides were washed three times for 10 min in PBS, and sections were then counterstained with DAPI (1:1000 diluted in 0.1% Triton X-100/PBS) to localize cell nuclei. As a control, sections were also incubated with GLUT-2/10 antiserum preabsorbed with a 10-fold excess of the appropriate antigenic peptide for 20 min. Images were observed with a Zeiss fluorescence microscope with an Axioplan 2 analysis system using Axiovision 4.5 software. Cell fluorescence was recorded by excitation at 450–490 nm. Leica software was used to capture images under identical conditions of imaging, illumination intensity, and photomultiplier settings. All experiments were carried out in accordance with the U.K. Home Office The Animals (Scientific Procedures) Act, 1986. Male BALB/c mice (6–8 wk old; Charles River Laboratories, Margate, U.K.) were used. Mice received 50 μl 0.05 mg/ml solution of LPS (E. coli 0127:B8; Sigma-Aldrich, Poole, U.K.; in sterile saline) or saline via the intranasal route while lightly anesthetized with 4% isoflurane. After 24 h mice were killed with an overdose of sodium pentobarbital and the trachea was quickly dissected away from surrounding tissues and further microdissected in Krebs salt solution. Flat preparations of trachea were made by cutting through the ventral aspect of the cartilage rings before being placed in a modified Ussing chamber. Flux experiments were performed using the same method as described for cell cultures. A separate group of mice was treated with LPS or saline in an identical manner to verify the extent of the inflammatory response to LPS. Mice were killed with an overdose of sodium pentobarbital and a cannula was inserted into the trachea. Three 0.5 ml aliquots of PBS were lavaged in and out of the airways. Total counts of cells in the bronchoalveolar lavage (BAL) fluid were determined using a hemocytometer. Differential cell counts were performed on cytospin preparations of BAL fluid stained with Diff-Quick (Gamidor Technical Services, Didcot, U.K.). Concentrations of murine TNF-α in BAL fluid were detemined by ELISA using a commercially available kit (PeproTech, London, U.K.). All chemicals and reagents were obtained from Sigma-Aldrich unless otherwise stated. Values are reported as the means ± SEM. Statistical analysis was performed using a paired Student t test or ANOVA tests followed by Bonferroni multiple comparison post hoc tests. A p value <0.05 was considered statistically significant. PIM treatment increased the concentration of glucose present in the H441 ASL from 0.24 ± 0.07 (control) to 0.70 ± 0.19 mM after 48 h exposure (p < 0.05 compared with control; n = 5) and further to 1.9 ± 0.43 mM after 72 h (p < 0.0001 compared with control and p < 0.01 compared with 48 h; n = 5; Fig. 1B). Although the mean concentration of glucose was higher than control after 24 h it did not reach statistical significance (Fig. 1B). No change in the viability of the airway epithelial monolayers was observed after 72 h PIM treatment (p < 0.05; n = 4; Fig. 1C), so PIM-induced apoptosis can be ruled out as an explanation for observed changes in glucose homeostasis. To understand how these changes occurred, we investigated the effect of PIMs on mechanisms that govern ASL glucose homeostasis, which have previously been characterized by our group (3). 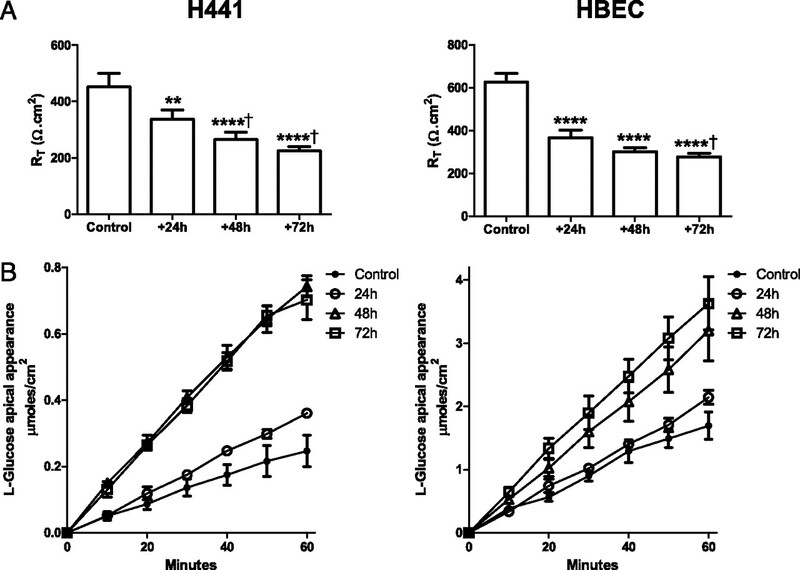 The glucose concentration of ASL overlying H441 airway epithelial monolayers increases following treatment with PIMs. (A) Time course of PIM treatment of H441 monolayers. PIM treatment began 7 d after seeding (for 72 h treatment), with PIMs added to both the apical and basolateral compartments in 50 μl and 1 ml glucose-containing RPMI 1640 media, respectively. Control monolayers also had media (50 μl) applied to the apical surface. All monolayers were washed and 50 μl glucose-free media was applied to the apical surface 9 d after seeding (24 h prior to end of time course). (B) ASL glucose concentration of H441 monolayers after 24, 48, and 72 h of PIM exposure. (*p < 0.05 compared with control, ****p < 0.0001 compared with control, p < 0.001 compared with 24 h, and p < 0.01 compared with 48 h; n = 5). (C) Cell viability in control and PIM-treated H441 monolayers (percentage of control cell monolayer viability; n = 4). Measurement of glucose uptake into epithelial cells across the apical or basolateral membrane showed that PIM exposure enhanced glucose uptake across the apical membranes of both H441 and HBE cells. 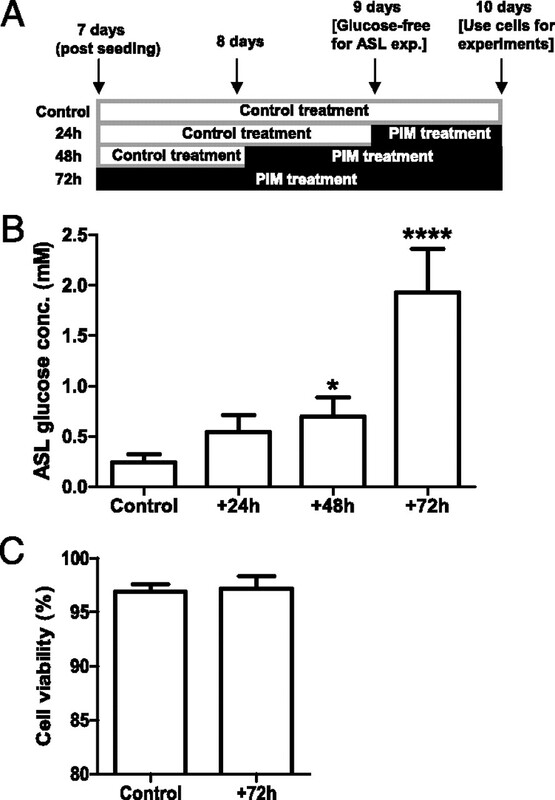 Compared to control (untreated cells), apical glucose uptake was increased by 42 ± 5 and 66 ± 24% in H441 after 48 and 72 h PIM treatment (p < 0.05; n = 5; Fig. 2), respectively. Apical glucose uptake was also increased in HBE monolayers and compared with control increased by 164 ± 53% after 72 h treatment with the inflammatory mediator mix (p < 0.05; n = 3). Interestingly, the increase in glucose uptake was restricted to the apical membrane. Uptake across the basolateral membrane was more variable and no significant changes in basolateral glucose uptake were observed between control or PIM treatment at any time point in either cell line (p < 0.05; n = 5; Fig. 2). To confirm that the changes in glucose uptake were mediated by GLUTs, further experiments were conducted on H441 cells in the presence of the GLUT-specific inhibitor phloretin (1 mM). Compared to control, a significant increase in phloretin-sensitive glucose uptake was observed across the apical membrane of H441 monolayers after 48 and 72 h PIM treatment (apical uptake increased by 116 ± 33 and 133 ± 22%, respectively; p < 0.05; n = 4; Fig. 3). No changes in GLUT-sensitive uptake were determined across the basolateral membrane (data not shown). These data are consistent with PIM enhancing apical GLUT-mediated glucose uptake. 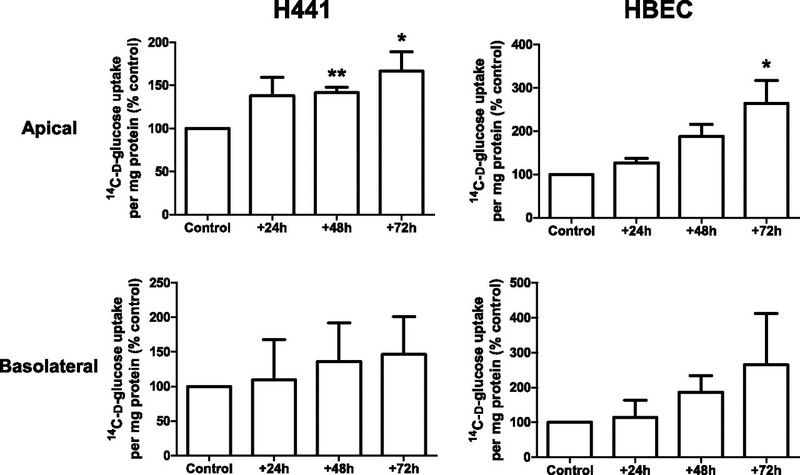 Proinflammatory mediator treatment increases d-glucose uptake across the apical membrane of H441 and primary HBE monolayers. Uptake of [14C]d-glucose across the apical and basolateral membranes of H441 and HBE monolayers after 24, 48, and 72 h PIM exposure compared with control untreated monolayers and shown as percentage control. *p < 0.05, **p < 0.01, compared with control; n = 3–5 as given in Results. Proinflammatory mediator exposure enhances phloretin-sensitive d-glucose uptake across the apical membrane of H441 airway monolayers. Phloretin-sensitive uptake of [14C]d-glucose across the apical membrane of H441 cell monolayers, after 24, 48, and 72 h PIM exposure, compared with control untreated monolayers and shown as percentage control. Phloretin (1 mM; GLUT inhibitor) was applied to the apical membrane for 30 min prior to commencing the uptake experiment. *p < 0.05 compared with control; n = 4. Correlating with the changes in glucose transport, an increase in GLUT-2 and GLUT-10 abundance was seen in PIM-treated H441 monolayers, as determined by immunocytochemistry (Fig. 4) and Western blot (Fig. 5). Taken together, glucose uptake and expression studies demonstrate increased, rather than decreased, glucose transport by airway epithelial cells in response to treatment with PIMs. Changes in glucose transport therefore do not explain elevation in ASL in response to an inflammatory stimulus. Proinflammatory mediators enhance GLUT-2 and GLUT-10 abundance in H441 airway epithelial monolayers. Untreated (control) or PIM-treated (for +24, +48, and +72 h) H441 cell monolayers immunostained with GLUT-2 (GLUT2 AB) or GLUT-10 (GLUT10 AB) antisera and FITC-conjugated secondary antiserum (green). GLUT-2 and GLUT-10 specificity was verified by comparison against immunoflorescence from cells immunostained as above but in the presence of antigenic blocking peptides (GLUT2 + BP and GLUT10 + BP, respectively). Overlays of GLUT-2 AB and GLUT-10 AB with corresponding images of cell nuclei stained with DAPI (blue) are also shown (GLUT2 + DAPI and GLUT10 + DAPI, respectively). Images were acquired with a ×40 oil immersion lens under identical conditions of illumination intensity and photo-multiplier settings. One set of images from n = 4 experiments is shown. 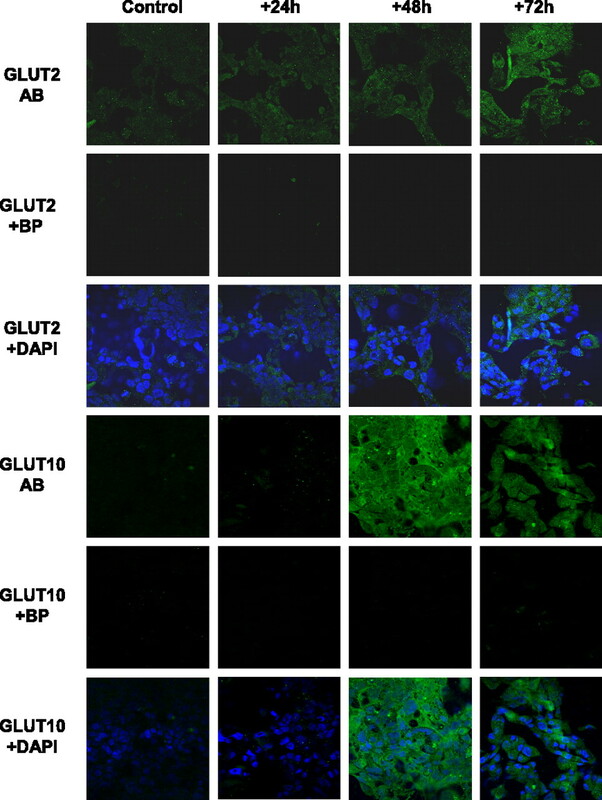 Proinflammatory mediators increase GLUT-2 and GLUT-10 protein abundance in H441 airway epithelial monolayers by Western blot. Western blot analysis of GLUT-2 (A) and GLUT-10 (B) expression (both ∼50 kDa) in lysates from untreated (control) and PIM-treated (for 24, 48, and 72 h) H441 cell monolayers. Band intensities (as a measure of abundance) were calculated by normalizing to β-actin (∼40 kDa) and are shown as percentage control. *p < 0.05 compared with control; n = 4. According to our model, an alternative explanation for elevation of ASL glucose under inflammatory conditions is an increase in paracellular glucose flux. Our group has previously shown that there is a correlation between RT and the rate of glucose flux through paracellular pathways across airway monolayers (3). After treatment with PIM, RT decreased at each time point from 453 ± 48 (control) to 225 ± 16 Ω⋅cm2 (72 h) in H441 and from 627 ± 40 to 278 ± 15 Ω⋅cm2 in HBE monolayers (p < 0.0001 compared with control, n = 8; Fig. 6A). There was a significant increase in the rate of [14C]l-glucose flux across both H441 and HBE monolayers in response to PIM exposure at 48 h (p < 0.01 compared with control) and 72 h (p < 0.001 compared with control, n = 4; Fig. 6B). Interestingly, whereas a significant decrease was seen in RT after 24 h treatment (p < 0.01; n = 4), no change in paracellular glucose flux was observed in either cell type until 48 h.
Proinflammatory mediator treatment decreases RT and increases the rate of paracellular glucose flux across H441 and primary HBE monolayers. (A) The effects of PIM treatment (24, 48, 72 h) on RT of polarized H441 and HBE monolayers. **p < 0.01, ***p < 0.001, ****p < 0.01 compared with control; †p < 0.05 compared with 24 h; n = 8. (B) Time course of apical l-glucose appearance across polarized monolayers of H441 and HBE cells. Transport was traced by applying [14C]l-glucose to the basolateral reservoir and sampling the apical reservoir for [14C]-radiolabel appearance at 10-min intervals for 1 h incubation at 37°C (48 h, p < 0.01 compared with control; 72 h, p < 0.001 compared with control in both cell types; n = 4). To verify whether an inflammatory stimulus results in a similar enhanced paracellular movement of glucose in vivo, radiolabeled l-glucose flux experiments were performed across excised trachea from LPS-treated mice. Similar to PIM treatment of airway epithelial monolayers in cell culture, LPS pretreatment (for 24 h) resulted in an ∼9-fold increase in [14C]l-glucose flux across mouse trachea (from 0.025 ± 0.010 (control) to 0.212 ± 0.052 μmol/min/cm2 (LPS-treated; p < 0.05; n = 3; Fig. 7A). The number of neutrophils obtained from BAL fluid was elevated in LPS-treated mice compared with saline controls (p < 0.0001 at both 3 and 24 h, compared with saline control; n = 6), confirming that LPS had induced an acute inflammatory response in the mouse airway (Fig. 7B). The inflammatory cytokine TNF-α was also present in the BAL fluid of LPS-treated mice, whereas TNF-α levels in control mice were undetectable. 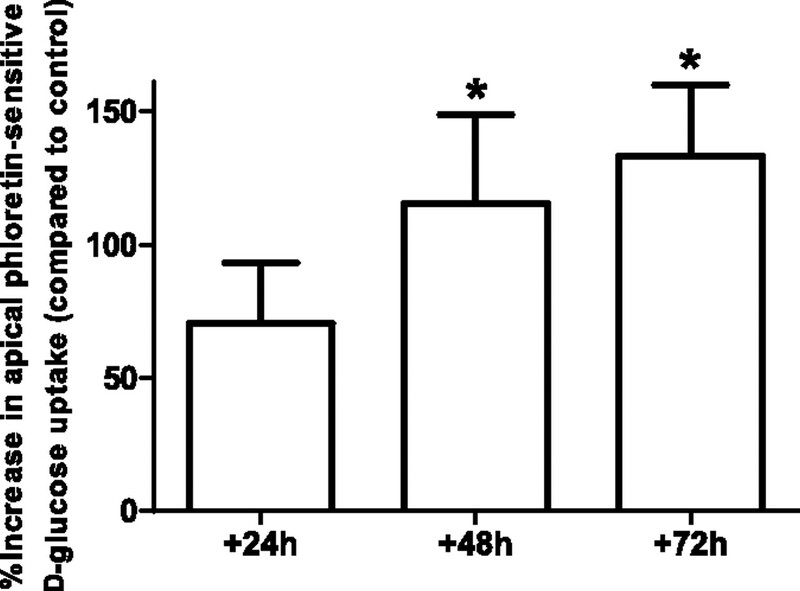 The concentration of TNF-α rose to 10.6 ± 0.5 pg/ml after 3 h LPS exposure and then returned to baseline by 24 h (Fig. 7C). LPS exposure leads to enhanced paracellular glucose flux across ex vivo murine trachea. (A) Time course of basolateral to apical l-glucose flux across excised trachea from saline (control) or LPS-treated mice (24 h exposure). Transport was traced by applying [14C]l-glucose to the mucosal reservoir and sampling the luminal reservoir for [14C]-radiolabel appearance at 20-min intervals, over a duration of 100 min. *p < 0.05 compared with control, n = 3. (B) Neutrophil count from BAL fluid of LPS and saline-treated mice after 3 and 48 h exposure. *p < 0.0001 at all time points compared with saline control, n = 6. (C) TNF-α concentration of BAL fluid from LPS-treated mice after 3 and 24 h. TNF-α was undetectable in BAL samples from control mice, n = 6. In humans, airway inflammation is associated with elevation of ASL glucose concentrations (2). In this study we have confirmed our clinical observations, by demonstrating that exposure of airway epithelial cell monolayers to proinflammatory mediators increases ASL glucose concentrations. We have shown that the underlying mechanism is increased basolateral to apical paracellular glucose flux, which exceeds compensatory upregulation of apical glucose transport. Because elevated ASL glucose concentrations compromise the sterility of the lungs and increase susceptibility to infection, insight into disruption of airway glucose homeostasis under inflammatory conditions could provide new therapeutic targets for lung infection. In both cell culture models (polarized H441 and HBE cell monolayers) and excised murine trachea, PIM treatment led to an increase in basolateral-to-apical paracellular flux of glucose. These changes were associated with a decrease in RT across airway epithelial cells. This is consistent with findings in primary human airway epithelial cell monolayers where cytokines elevated in chronic lung inflammation (TNF-α and IFN-γ) for 72 h increased epithelial permeability to small and large solutes (10 and 2000 kDa dextrans) (17). However, interestingly, whereas a significant decrease was seen in RT after 24 h treatment, no change in paracellular glucose flux was observed until 48 h. The route taken by glucose through epithelial tight junctions is currently unknown. Recent evidence indicates that factors regulating ion movement through epithelial tight junctions may be different from those regulating small noncharged solutes (21–24). Because RT is a measure of resistance to ionic movement, this measurement may not accurately represent the resistance to movement of small noncharged solutes such as glucose (24, 25). In support of this, we have previously shown that the relationship between RT and glucose appearance in the apical chamber of H441 cells was not linear. As RT decreased, there was an exponential increase in glucose appearance (3). At the RT values determined in the present study, our finding that there was little change in glucose flux after a 24-h treatment with PIMs (RT ≥ 300 Ω⋅cm2) would be consistent with our previous observations that there is little movement of glucose at these resistance values. However, because RT decreased from 300 to 200 Ω⋅cm2 48 and 72 h after treatment with PIMs, there would be an incremental rise in glucose flux resulting in increased glucose appearance in the ASL. Over time, this would lead to glucose accumulation in ASL, particularly if the processes mediating glucose uptake from the apical membrane were also compromised, resulting in further elevation of ASL glucose at 72 h after PIM treatment. These findings are important because the paracellular pathway taken by glucose through epithelial tight junctions may represent an important therapeutic target to maintain airway sterility and restrict the growth of glucose-utilizing bacteria in inflammatory airway disease. Glucose transport was investigated, since a decline in GLUT-mediated uptake by the epithelium could also contribute to the PIM-induced increase in ASL glucose. Conversely, we found that apical glucose uptake via GLUTs was increased in human airway cells in vitro. In our model, this would serve to reduce glucose accumulation in ASL. However, further analysis of our in vitro experiments showed that paracellular glucose flux (∼4.1 nmol/min/cm2; n = 3) was approximately equal to the combined effects of apical and basolateral glucose uptake (apical, ∼1.1; basolateral, ∼ 2.9; total, ∼4.0 nmol/min/cm2; n = 3) in control H441 airway monolayers. However, after 72 h PIM treatment, paracellular glucose flux (∼12.1 nmol/min/cm2; n = 3) exceeded bilateral glucose uptake (apical, ∼1.7; basolateral, ∼3.3; total, ∼5.0 nmol/min/cm2; n = 3), which would lead to an increase in ASL glucose. Thus, even though glucose transport was upregulated, this was insufficient to balance the increased paracellular glucose leak and prevent an increase in glucose concentration in ASL. We showed previously that inhibition of apical GLUT uptake with phloretin increased accumulation of apical glucose. Importantly, our data therefore indicate that without the contribution of GLUT-mediated uptake, it is likely that glucose levels in ASL would rise further in response to PIMs. Interestingly, GLUT-10 expression correlated with the increase in apical phloretin-sensitive glucose uptake. Pezzulo et al. (6) recently showed that GLUT-10 is expressed in HBE monolayers, but little is known about its contribution to overall glucose transport in airway epithelia. Because the significant increase in apical glucose uptake occurs at the same time point (after 48 h PIM treatment) as the increase in GLUT-10, but not GLUT-2, abundance, we speculate that GLUT-10 may play an important role in transporting glucose under these conditions. Further work is now required to elucidate its function in the airway. These findings also raise the possibility that GLUT transport could be further stimulated to lower ASL glucose and harnessed as an additional therapy for airway inflammatory disease. In conclusion, exposure of airway epithelial cell monolayers to a mixture of proinflammatory mediators leads to an increase in ASL glucose concentration and supports our clinical data that ASL glucose is increased in airway inflammation (1, 2). Elevation of ASL glucose concentration was predominantly the result of increased paracellular flux of glucose (due to the enhanced permeability of epithelial tight junctions), which was not overcome by a compensatory increase in apical GLUT-mediated glucose transport (Fig. 8). These experiments provide an insight into the mechanisms that are disrupted under inflammatory conditions and may provide new therapeutic targets for lowering airway glucose to decrease the associated respiratory infection. 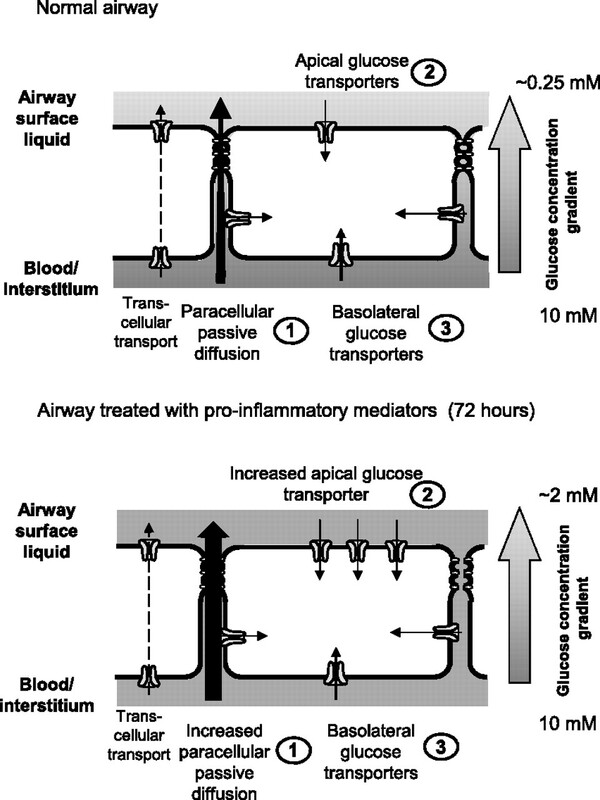 Proposed mechanisms controlling glucose concentrations in airway surface liquid. Upper panel, Under normal conditions, glucose predominantly diffuses from blood/interstitial fluid across the respiratory epithelium into ASL via paracellular pathways, and this is limited by the permeability of the epithelium. Apical and basolateral facilitative GLUT-mediated transport restricts glucose accumulation in ASL (there is little evidence for Na+/glucose cotransport in these airway cells). Glucose taken up into the cell is rapidly metabolized. This is critical to maintain low intracellular glucose concentrations, which provide a driving force for glucose uptake via GLUTs. It also limits the transcellular transport of glucose and predicts that ASL glucose concentrations equilibrate with intracellular glucose concentration. Lower panel, Proinflammatory mediators reduce transepithelial resistance and increase paracellular diffusion of glucose across the epithelium into ASL. Although apical GLUT-mediated glucose transport and GLUT-2 and GLUT-10 abundance are increased, this is insufficient to prevent a rise in glucose concentration in the ASL. This work was supported by Wellcome Trust Grant 088304/Z/09/Z.
. 2003. Factors determining the appearance of glucose in upper and lower respiratory tract secretions. Intensive Care Med. 29: 2204–2210.
. 2007. Hyperglycemia and cystic fibrosis alter respiratory fluid glucose concentrations estimated by breath condensate analysis. J. Appl. Physiol. 102: 1969–1975.
. 2009. Glucose homeostasis across human airway epithelial cell monolayers: role of diffusion, transport and metabolism. Pflugers Arch. 457: 1061–1070.
. 1996. Effect of changes in paracellular permeability on airspace liquid clearance: role of glucose transport. Am. J. Physiol. 270: L191–L198.
. 2008. Apical and basolateral localisation of GLUT2 transporters in human lung epithelial cells. Pflugers Arch. 456: 991–1003.
. 2011. Glucose depletion in the airway surface liquid is essential for sterility of the airways. PLoS ONE 6: e16166.
. 2005. Glucose in bronchial aspirates increases the risk of respiratory MRSA in intubated patients. Thorax 60: 761–764.
. 1996. The effect of diabetes mellitus on the outcome of patients with chronic obstructive pulmonary disease exacerbated due to respiratory infections. Respiration 63: 170–173. 2001. The inflammatory response in humans after inhalation of bacterial endotoxin: a review. Inflamm. Res. 50: 254–261.
. 2009. Pseudomonas aeruginosa LPS or flagellin are sufficient to activate TLR-dependent signaling in murine alveolar macrophages and airway epithelial cells. PLoS ONE 4: e7259.
. 2010. Lipopolysaccharide modifies amiloride-sensitive Na+ transport processes across human airway cells: role of mitogen-activated protein kinases ERK 1/2 and 5. Pflugers Arch. 459: 451–463.
. 1996. TNF-α, IL-8, soluble ICAM-1, and neutrophils in sputum of cystic fibrosis patients. Pediatr. Pulmonol. 21: 11–19.
. 1999. Distinct sputum cytokine profiles in cystic fibrosis and other chronic inflammatory airway disease. Eur. Respir. J. 14: 339–346.
. 2011. Anemia of chronic disease in chronic obstructive pulmonary disease: a case-control study of cardiopulmonary exercise responses. Respiration 82: 237–245.
. 1999. Cytokine expression in bronchial biopsies of cystic fibrosis patients with and without acute exacerbation. Eur. Respir. J. 14: 1136–1144.
. 2006. [Pathogenesis of chronic obstructive pulmonary disease. Cellular mechanisms (part I)]. Wiad. Lek. 59: 92–96.
. 2002. Regulation of airway tight junctions by proinflammatory cytokines. Mol. Biol. Cell 13: 3218–3234.
. 2000. The diffusive component of intestinal glucose absorption is mediated by the glucose-induced recruitment of GLUT2 to the brush-border membrane. Biochem. J. 350: 155–162.
. 2012. Overproduction of angiotensinogen from adipose tissue induces adipose inflammation, glucose intolerance, and insulin resistance. Obesity (Silver Spring) 20: 48–56.
. 1986. Basal-lateral transport and transcellular flux of methyl alpha-d-glucoside across LLC-PK1 renal epithelial cells. Biochim. Biophys. Acta 885: 233–239.
. 2008. The density of small tight junction pores varies among cell types and is increased by expression of claudin-2. J. Cell Sci. 121: 298–305.
. 2007. Molecular physiology and pathology of tight junctions. III Tight junction regulation by intracellular messengers: differences in responses within and between epithelial. Am. J. Physiol. Gastrointest. Liver Physiol. 279: G660–G665.
. 2008. Tight junctions at a glance. J. Cell Sci. 121: 3677–3682.
. 2011. Tight junction pore and leak pathways: a dynamic duo. Annu. Rev. Physiol. 73: 283–309.
. 2007. Claudins and paracellular transport: an update. Curr. Opin. Nephrol. Hypertens. 16: 459–464.